Recognizes a protein of 33-37 kDa, identified as CD20 (Workshop V; Code CD20.12). Daudi, Raji, and U266, and human lymphocytes. In normal lymph nodes and tonsils, CD20 is predominantly detected on B cells in germinal centers. Recognizes a protein of 33-37 kDa, identified as CD20 (Workshop V; Code CD20.12). B9E9 recognizes extracellular domain of CD20. The epitope is similar to or identical to that recognized by other CD20 antibodies including Leu-16 and B1. This MAb can be used for immunophenotyping of leukemia and malignant cells, B lymphocyte detection in peripheral blood, B cell localization in tissues and B lymphocyte purification by immunosorbent methods. 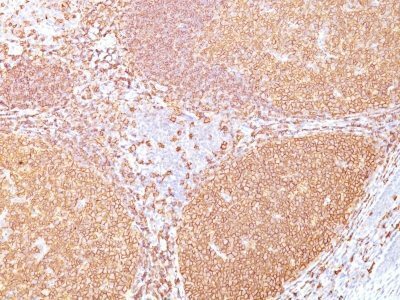 CD20 is a non-Ig differentiation antigen of B-cells and its expression is restricted to normal and neoplastic B-cells, being absent from all other leukocytes and tissues. CD20 is expressed by pre B-cells and persists during all stages of B-cell maturation but is lost upon terminal differentiation into plasma cells. Protein passes through the membrane 4 times with both ends in cytoplasm and exposes one short and one longer loop to the external environment. CD20 is not glycosylated in resting B cells and its cytoplasmic domains are differentially phosphorylated upon activation. It acts as a calcium channel involved in B-cell activation and cell cycle progression. Catalog number key for antibody number 0160, Anti-CD20 (B9E9) The prefix indicates conjugation, followed by the antibody number and size suffix.